Healthly. Sustainably. Seasonally. There are many reasons to buy local food for your institution. Our technical assistance providers recognize that there are challenges for procuring local food directly from farmers for your institution. Budgets, delivery, volume and a whole host of the other issues create barriers to working directly with farmers. LIFT wants to work with your institution to make it easier to purchase local food whether from broadline suppliers, food hubs, or direct from the farm. We help build relationship with your local farms. Many broadline suppliers as well as regional distributors will work with local farms that meet their requirements if you ask for local products. Here are a few tools to start the conversation with your existing food service provider. Farm to Institution New England (FINE) developed the below toolkit for all institutional purchasers sourcing local food from distributors. San Diego County Farm to School Taskforce developed the below resource on questions to ask your Vendor or Distributor when trying to source from small, local, and sustainable farms. Why buy through a FoodHub? Convenient for buyers to source fresher, more nutritious and better tasting products direct from local farms with an online marketplace, streamlined payment options and safe, aggregated delivery to their door. Opens up new markets for farmers to deal directly with businesses and institutional buyers who seek local products, and who purchase large volumes of food, but typically do not shop at farmers markets or farm stands. Equitable to farmers who are empowered to develop and maintain direct customer relationships, negotiate their own prices and nurture business growth for their own farms. They do not hand over their customers, or steep margins, to a third-party. Traveling distance between farm to customer is shortened compared to broad line distributors. Seller farms operate within the 6 counties of northwest Washington including Whatcom, Skagit, Island, San Juan, Snohomish and King. Puget Sound Food Hub is a network of farms and partners operating cooperatively in the Puget Sound region to market, aggregate and distribute locally produced food from farm to restaurants, hospitals, preschools, grocery stores, universities and more. It is a project of the Northwest Agricultural Business Center. 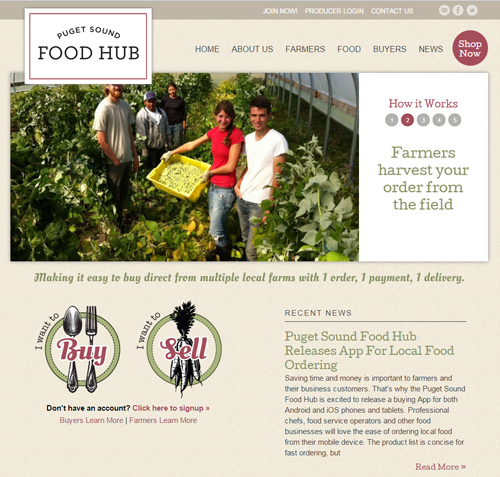 Puget Sound Food Hub saves customers time and money for farmers and their customers. Customers can order from multiple farms through one vendor agreement. Customers aren’t interrupted by multiple farm deliveries. Farmers don’t have to chase customers for payments. Single aggregated delivery is convenient for customers and reduces carbon footprint significantly. Farmers spend less money and far less time off the farm delivering to their customers. Energy costs are kept to a minimum with centralized cold storage and ensures food safety, transparency and quality for customers. Why buy direct from Producers? Order from the field! Food is fresher than any typical distributor’s offerings. Fresh produce is often picked the day before it reaches the customer. It’s ripe, in season and oh-so-delicious! Purchasing local food supports local farms, increases our region’s food security, protects the environment, creates jobs and boosts the local economy. You get to know your neighbors and where food comes from. Just because we live in a city doesn’t mean there aren’t veggies outside our back door. 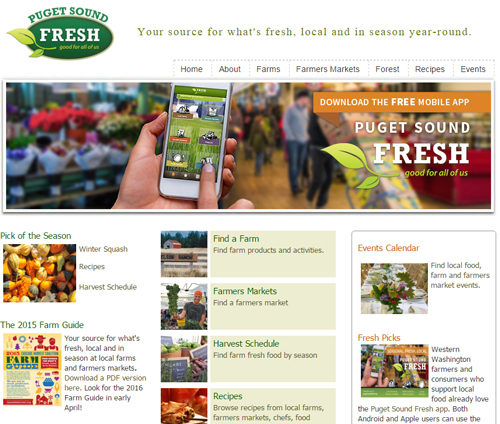 The Puget Sound Fresh program provides both consumers and institutional buyers with resources and tools to help them identify and make informed choices on how to find and purchase seasonal and locally grown, raised or harvested foods. The Puget Sound region supports a diversity of fresh fruits and vegetables, meats, poultry, fish and shellfish, eggs, herbs, flowers and a wide variety of value added-farm products such as preserves, ciders and wine, cheese and many others. The program also helps consumers connect with on-farm experiences such as U-Picks, special on-farm events and pumpkin patches.